This Webdirexion A/B Test resulted in a 493% gain in qualified leads — click to enlarge. 493%? 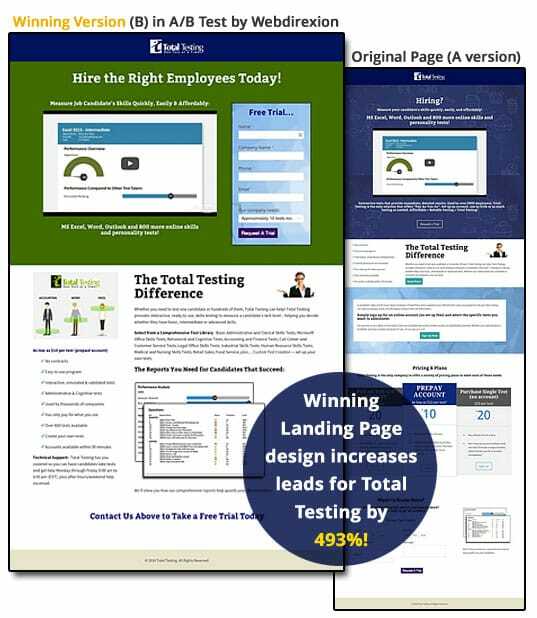 That’s right — we achieved this gain for leads with an A/B landing page test for Total Testing, a Georgia based online human resource testing firm. And because many tests result in lower gains, when you hit one out of the park it’s always good to look at tactics used. How did we do it? Well, just like I explained in a recent “ConversionCast Podcast” interview, it was all bout a focus on fundamental marketing principles of persuasion that carried this test to a great result. The podcast above discusses still another A/B test where we won a 100% improvement for our client, Croc’s Resort on a tropical beach in western Costa Rica. Between these two tests, you’ll get a great idea of our methodology. And if you’re newer to CRO… I recommend our Marketer’s Concise Guide to CRO — it’s getting good reviews on Amazon. So 100% gain for one client, and 493% for another — is it always like that? Nope. More often you see a series of iterative gains in the 5% – 25% range. But that’s the important thing… always be making iterative gains using CRO strategies and tactics. But the advice in the book can really pay off as you can see. I’m hard pressed to name another digital marketing tactic that results in better ROI. Too many times these days we see people in our industry focusing on the latest technology and software and coming up with a set of tactics in search of a strategy. That’s upside down for an approach. We practice “R.A.C.E.” based marketing for our clients — Reach; Act; Convert; Engage — and the strategies that work are the same no matter your tools. Start with timeless principles as taught for decades (and tested for decades) in Marketing Communication college courses. Then pick your testing tool. It is not the tool or the technology that makes the difference… it is your marketing strategy and tactics that make things happen. In this case we started with a testing hypothesis (remember… always start by writing out a hypothesis) that focused on the basics: If we move lead form up, add a benefit headline, reduce links going off page, plus clarify value proposition we will get more leads. You can learn more about our thinking on A/B testing by listening to the podcast reviewing our success for a Resort client in Costa Rica. 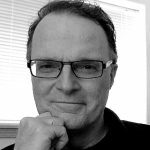 And I highly recommend the ConversionCast library of podcasts with host Tim Paige, for more ideas on this subject. Contact us if you’d like a PDF case study for the Total Testing A/B test.